You may have noticed from my endless twittering yesterday that I was on the beach enjoying the Bournemouth Air Festival. I am pleased to say that the Vulcan made just as deep an impression on my 13 year-old son as it did on me when I was a child back in the 70's. It's the combination of thunderous noise, the extraordinary beauty of the design and the vast size that does the trick. 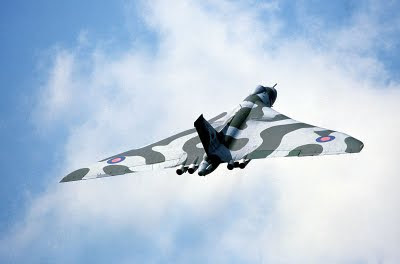 Today, I've been sitting in my back garden and I can hear that the Vulcan is back. It's about 3 miles away, above the seafront but is still filling the sky with thunder. In the early 1990's, they used to have an airshow at Hurn airport, just up the road from me, and I remember a visit from the Vulcan back then. It did some aerobatics a few hundred feet above my house. Every window shook in its frame. Almost as loud today and yesterday was the Typhoon. What a class act that is. It appeared seemingly out of nowhere, rearing up above the pier. After a ten minute display, it made an awesome exit - vertically upwards at speed, where it disappeared into a bank of cloud. There is something about British Air Shows. Have been to a few incl. one where there was a mid-air collision of Mig 29's (pilots luckily ejected safely) and I also have very fond memories of seeing the Vulcan in action. How do they keep all that weight in the sky? I used to work in the laboratories where the fuel tank sealant was made. We'd done a lot of work to replace the asbestos in the formulation and were very pleased with the new grade, which gave longer open times and faster cure. As you can imagine there is a lot of specification testing completed before any modify formulation can be launched on the aerospace market. The results were excellent and BAe loved the new grades, however, we were shocked to hear reports from the Red Arrow technicians that the sealant was not sticking and either too runny or too thick to apply. The Hawk like most modern aircraft has an integral fuel tank - the fuel is stored in the wing and was leaking out over the engines - which is not good. An immediate investigation was required. I visited RAF Filton where the repair work was being carried out and couldn't believe how they had been using the original formulation. On small aircraft such as the Hawk the technician cannot climb inside the wing to effect repairs. They are restricted to small access points, a panel is removed and the technician would reach in and feel around for exposed bolts and other points of potential fuel leakage. (In combat a patch is applied). The original sealant formulation had cured so slowly the technicians had been able to wait for it to thicken (after the allocated pot life) then roll it in a ball and apply it like putty. The new sealant stayed liquid for longer and then cured faster (making it unusable either within or after it's pot life). It was obvious they'd always needed a specialist grade of sealant and had just modified their working practice to make the original sealant work. Sealing aircraft is a difficult task. They use around 3 tonne of sealant on a 747, which requires a lot of fuel just to carry the sealant around the world. They always said if the runway was dry under Concord they should send for the fuel tanker. Concord had to use a unique sealant formulation because of the temperatures generated, but it still wasn't 100% effective - the aircraft stretched so much in flight due to thermal expansion. After that fatal fire the integral fuel tanks were replaced by fuel bags. Military aircraft fly as fast but not for a long so the temperatures are generally lower and they can use traditional sealing methods. The technicians do a great job, but still, I'd rather watch from the ground.